Territory, Abuja on Friday morning. The mishap happened when the airplane were completing their day by day practice in front of their presentation amid Nigeria's 58th independence commemoration on Oct. 1. 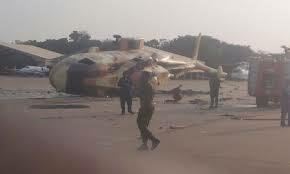 Spokesman of the Nigerian Air Force, Air Commodore Ibikunle Daramola said the said that no life was lost. The accident, according to sources, happened in Katampe hills in Abuja. The two pilots were said to have ejected from the aircraft.